Here we are with this week’s Tuesday Challenge (yay!). Do you know Lewis Carroll’s poem ‘The Mouse’s Tale’? That’s an example of a shape poem. Shape poems often work better when they are read on the page. If you read them aloud, your audience can’t see the shape along with the words. Shape poems are like art and poetry combined. Here is the first of the shape poems sent in by you! Until the end of August we’ll have a new poetry challenge every Tuesday. I’m so enjoying this series. Today’s example is really lovely! Gosh – that was a tricky one. I bet lots of children could do a better job than me. I’ve emailed my poem. Great poem, Tricia! I like the simile ‘my hands as white as bleach’. Thanks Korg, It was a challenge to make the shape work. 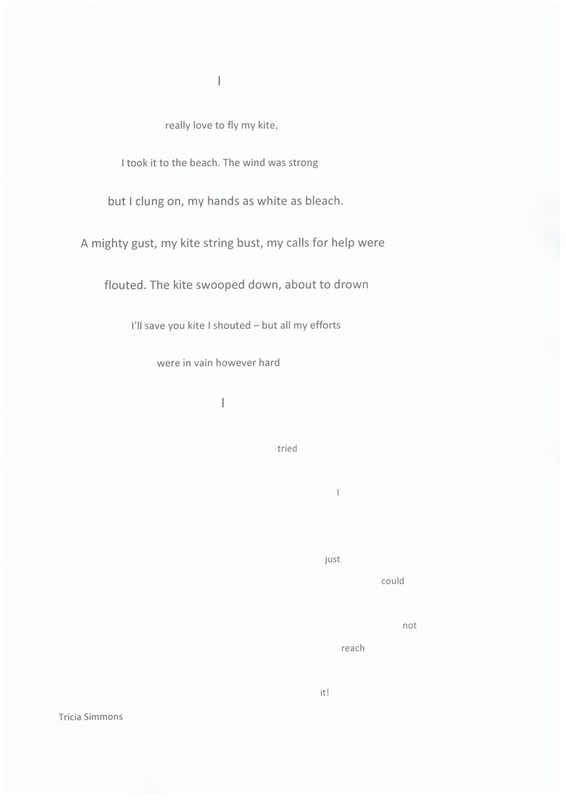 I hadn’t written a shape poem before which is why I’ve so enjoyed Rebecca’s Tuesday Challenge.